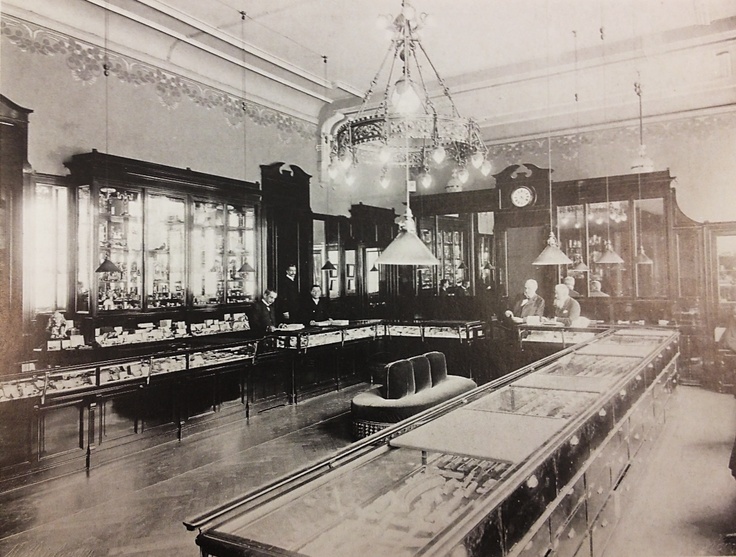 Previously on this blog, there have been numerous posts regarding the British Royal Family including posts about the Queen’s Jewelry Collection and the Cambridge Jewels. In 1921 Queen Mary acquired a diamond and pearl tiara now known as the Grand Duchess Vladimir Tiara which was originally smuggled out of Russia by a British diplomat during the 1917 Revolution. 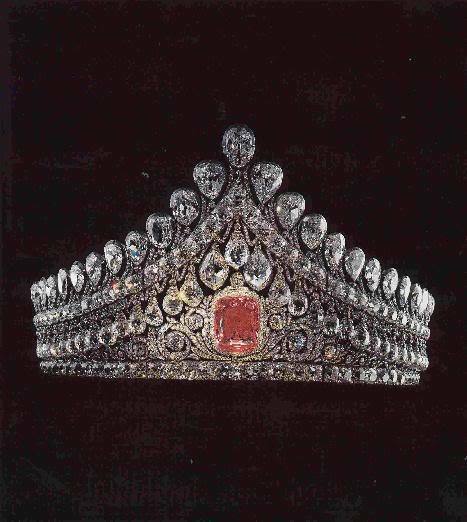 The Vladimir Tiara, now in the personal jewelry collection of Queen Elizabeth II, is one example of many Russian Imperial Jewels that survived after the Russian Revolution. Unfortunately, many other items belonging to the Russian Imperial Family mysteriously vanished and have been lost. 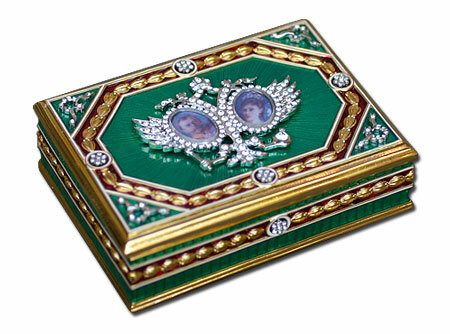 In this post, I will discuss many of the Russian Imperial Jewels by giving individual descriptions and a brief history of each item and indicate which ones still exist either in a private collections or held in museums. The Great Imperial Crown was first used for the coronation of Catherine II in September 1762 in Moscow and the last time it was used was for the coronation of Nicholas II in May 1896 in the Uspensky Cathedral inside the Kremlin. 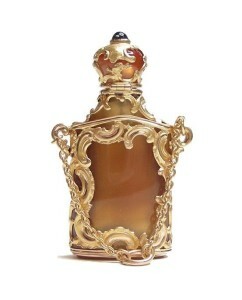 The crown was designed by Jeremie Pauzie and the design was inspired by the Byzantine Empire. 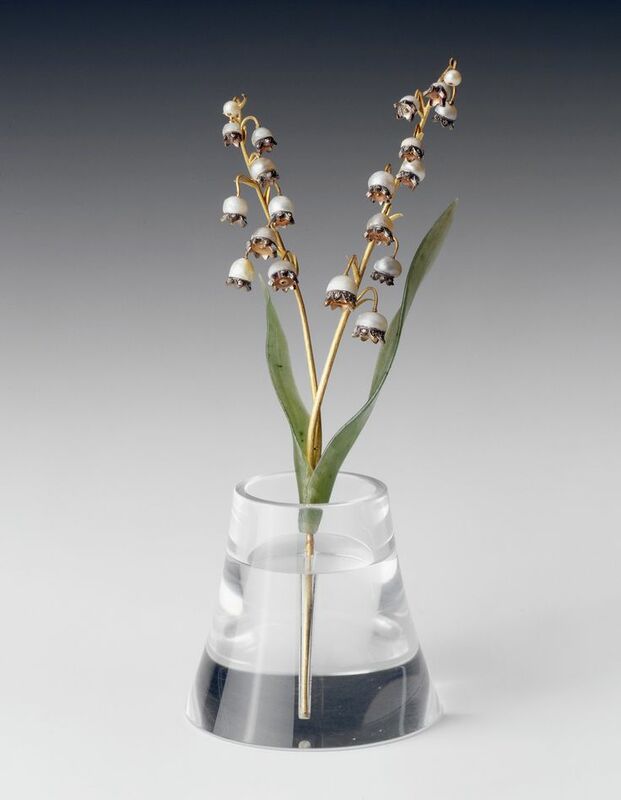 It was created as two gold and silver half spheres divided with a floral garland which represented the joining of the Eastern and Western Roman empires. The crown has 75 pearls and almost 5,000 diamonds which form laurel and oak leaves which symbolically represent power and strength. At the top is a cross of five diamonds, representing the Christian faith of the Sovereign, the God-given power of the monarchy and the supremacy of the divine order over earthly power, set above an almost 400 carat red spinel. The spinel (sometimes confused and difficult to distinguish from a ruby, this gemstone made of a hard glassy mineral usually formed as octahedral crystals) was originally brought from China to Russia by Nicholas Spafary, a Russian envoy, approximately in 1676. 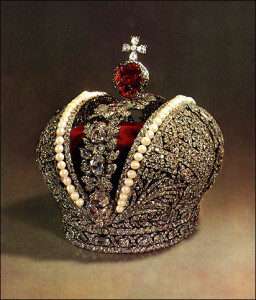 Several centuries later the Great Imperial Crown made it out of Russia at the time of the Russian Revolution in 1917. 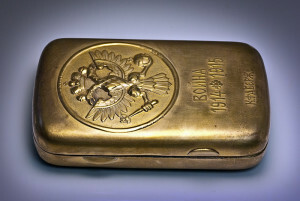 It was then temporary held in Ireland and ultimately was returned to Russia and can currently be seen display at the Kremlin Armory in Moscow. 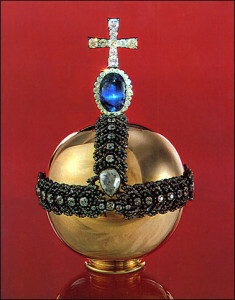 Russian Imperial Orb was created for the coronation of Catherine II by the Russian court jeweler, Georg-Fredrik Ekart. 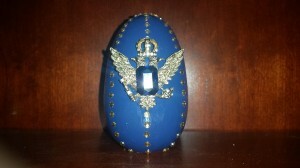 The gold orb is a polished hollow sphere encircled with a row of diamonds, then topped with an oval 47 carat sapphire surrounded by diamond and a gold cross with more diamonds. The Russian Imperial Orb is on display at the Kremlin Armory in Moscow. 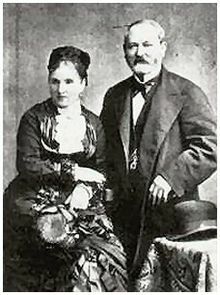 The brides of the Russian Imperial family have traditionally worn several pieces of jewelry at their weddings, such as the Russian Nuptial Tiara and Crown (yes, the brides wore both!). Other items included the Russian Nuptial Necklace and Earrings and the large Russian Nuptial Brooch that was used to fasten the ermine robes worn by the bride at the wedding ceremony. 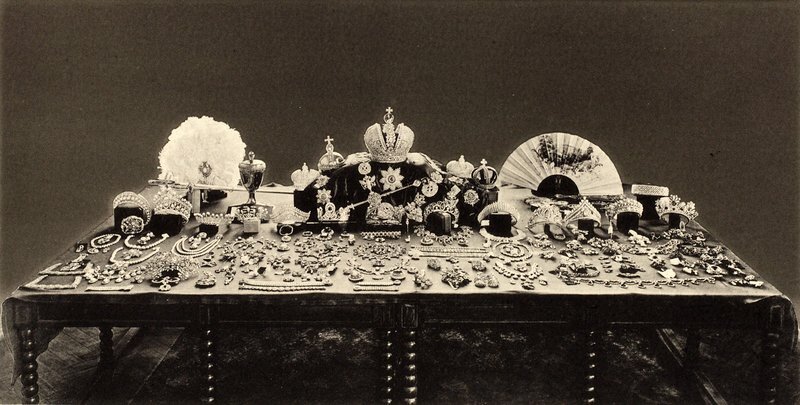 Several of the jewels became lost after the revolution and others are held in museums, such as the Nuptial Crown which is on display at the Hillwood Museum in Washington, D.C. and the Nuptial Tiara is at the Kremlin Armory in Moscow, Russia. The Russian Nuptial Tiara has been worn by the Russian Imperial brides, including tsarinas and grand duchesses throughout the centuries. 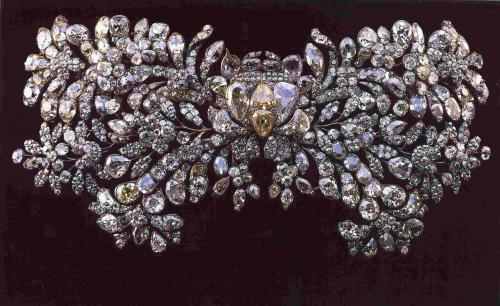 The large diamond tiara was created around 1800 by Jacob David Duval, a St. Petersburg jeweler, for Empress Elizabeth Alexeievna. The largest stone set in the centered in the lower portion of the tiara is a remarkable 13 carat pink diamond; in addition there is a row of briolette diamonds topped by diamond uprights. Surprisingly, the tiara survived the Russian Revolution and is now displayed at the Kremlin Armory in Moscow. 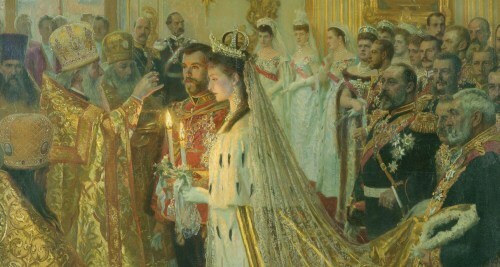 This photo is a portion of the portrait by Laurits Tuxen of the 1894 wedding of Emperor Nicholas II and Princess Alexandra, the princess is seen wearing both the Russian Nuptial Tiara and Crown. As part of the Eastern Orthodox Holy Matrimony, not only are rings exchanged as part of the ceremony, crowns are also placed on the heads of both the bride and groom. 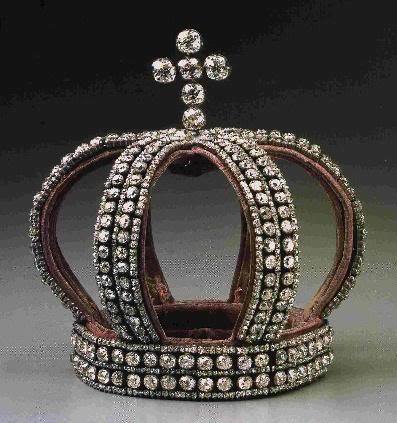 The Russian Nuptial Crown was made around 1844, possibly by Nichols and Plincke jewelers. 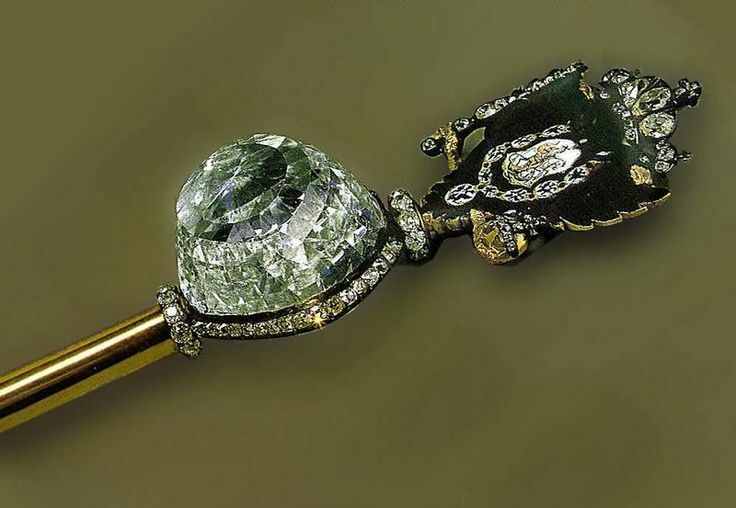 There are 320 large diamond weighing approximately 182 carats and 1,200 smaller diamonds totally 80 carats; it is thought that most of the diamonds were previously used to embellish the clothing of Catherine II. The diamonds are set in silver and mounted onto a crimson red velvet crown. At a specific point in the wedding ceremony, the Nuptial Crown is placed behind the Nuptial Tiara. 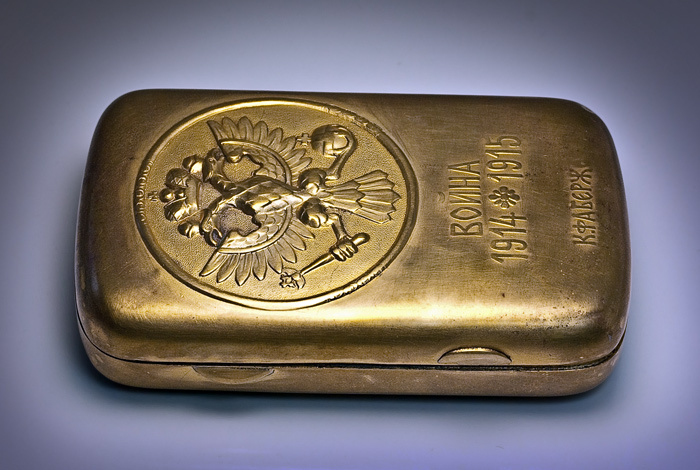 During and after the Russian Revolution, the Bolsheviks sold many of the Imperial Royal Family’s Jewels although some were secretly smuggled out of Russia possibly hidden in clothing or transported by way of couriers into other countries. 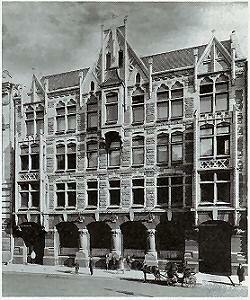 Records indicate that the Nuptial Crown was sold by Christie’s Auction House in 1927. It was acquired by Marjorie Merriweather Post, an American businesswoman and heiress of the Post Cereal Company which she expanded into General Foods. 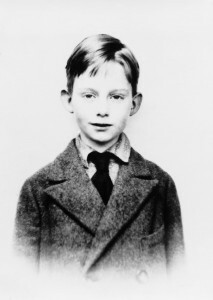 In the 1930s, when her husband was the U.S. 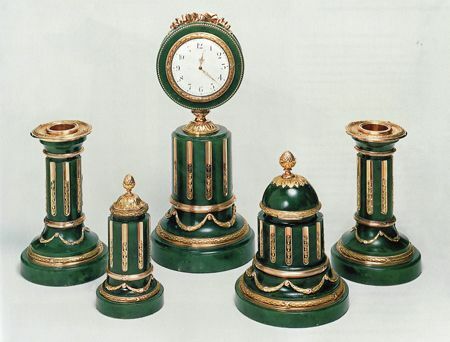 Ambassador to the Soviet Union she continued collecting Imperial art and artifacts and eventually her collections was given to the Hillwood Museum in Washington, D.C. In addition to the Russian Imperial Tiara and Crown, the Romanov brides would wear other stunning diamond jewelry. 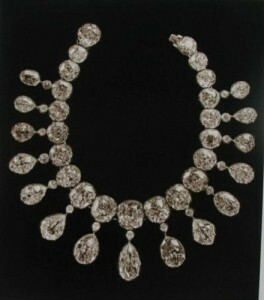 The Russian Rivère Diamond Necklace was a set of large diamonds and even more pear-shaped diamond drops that weighed a total of 475 carats; the necklace was once part of the Russian Imperial Crown Jewels. 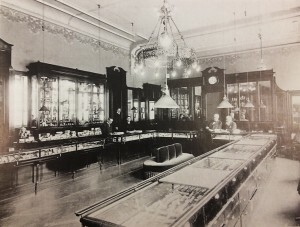 During the time of the Russian Revolution the necklace was sold to an unknown buyer and has since mysteriously disappeared. 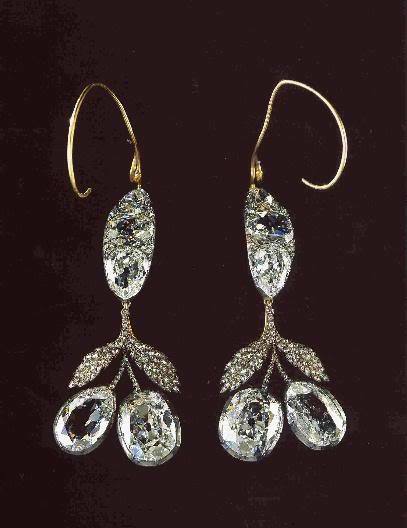 The matching earrings were originally commissioned by Catherine II and are large Brazilian diamonds are set in gold and silver and styled as cherries and stems. 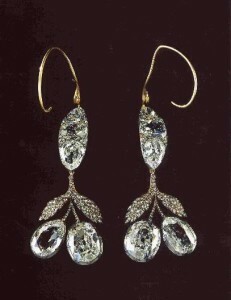 The earrings are so heavy to wear that a special support wire was fashioned to be worn wrapped behind and over the ears; unfortunately the wire would frequently cut into the bride’s ears. Over the wedding gown, the bride would wear the Imperial Mantle made of embroidered golden fabric edged with ermine; the mantle was also worn for coronations. 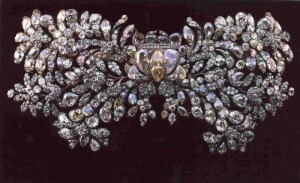 To fasten the mantle a magnificent clasp was used and it was set with diamonds of various sizes and shapes, it measured approximately 8 inches across. Shown below in the photo is the Grand Duchess Maria Pavlovna on the occasion to her 1908 wedding to Prince William, the Duke of Sodermanland who was the second son of King Gustav V of Sweden. 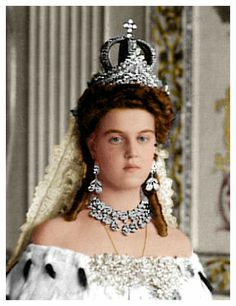 She is wearing the complete set of Imperial Nuptial Jewelry including the Russian Rivère Diamond Necklace and Earrings and the Imperial Mantle Clasp. The Russian Aquamarine Kokoshnik Tiara was said to be once owned by the last tsarina, Alexandra Feodorovna, married to Nicholas II of Russia. The tiara was created around 1900 and it is styled in a kokoshnik (a traditional Russian headdress) shape. 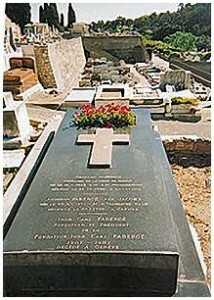 The tiara has line and arches of diamonds and also features 16 graduated rectangular aquamarine stones set in platinum. 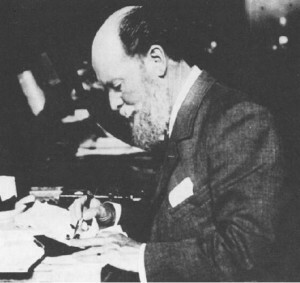 Shortly after the Russian Revolution the tiara was bought by Morris Wartski, an antique dealer based in England that specialized in Russian jewelry and artwork. 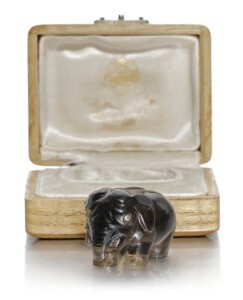 Over the years, the tiara has sold several times through auction houses such as Stotheby’s and Christie’s. At the present time, the owner of the Russian Aquamarine Kokoshnik Tiara is unknown. 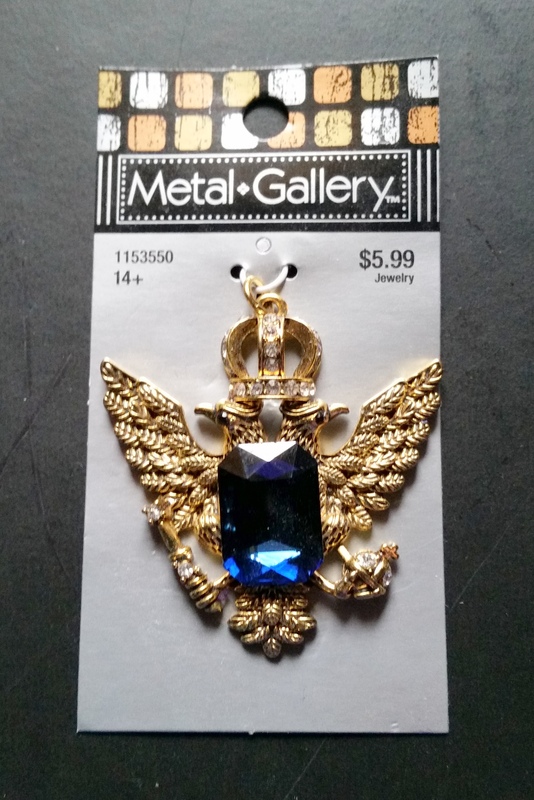 The Imperial Russian Bow Necklace is a beautifully designed fully articulated (sections connected by flexible joints) necklace. In an open setting made entirely in silver, the necklace features a row of twenty-seven cushion-cut graduated-sized diamonds. 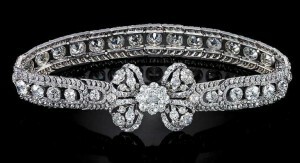 Bordering the large diamonds are two additional rows of smaller diamonds and finished with a diamond bow clasp. 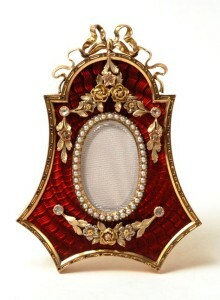 The Russian Pearl Pendant Kokoshnik Tiara was originally made in 1841 by the court jeweler Bolin for Alexandra Feodorovna, the wife of Nicholas I. 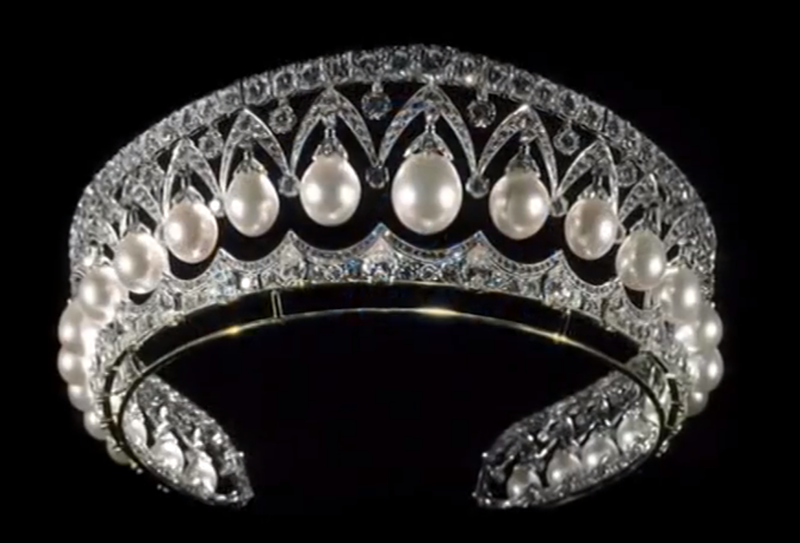 The kokoshnik styled tiara features twenty-five large pearl pendants which hang from diamond arches attached to a diamond base. After the Russian Revolution, the tiara was sold by Christie’s auction house in 1927 to the Holmes & Company Jewelers. Later the tiara was bought by the Duke of Marlbourough for his wife Gladys. After her death it was sold once again at auction in 1978 and was eventually bought by Imelda Marcos, the wife of Ferdinand Marcos who was the President of the Philippines. It was said that the tiara was purchased under dubious circumstances possibly using state funds and after the disgraced couple fled their remaining possessions were confiscated including Imelda’s excessive quantities of jewels and shoes (remember that infamous massive shoe collection). 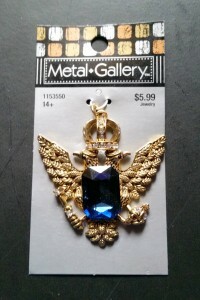 The Russian Pearl Pendant Kokoshnik Tiara now reportedly sits in a bank vault in the Philippines. 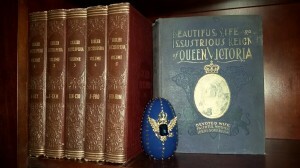 This post discusses just a small portion of the Russian Imperial Crown Jewels. 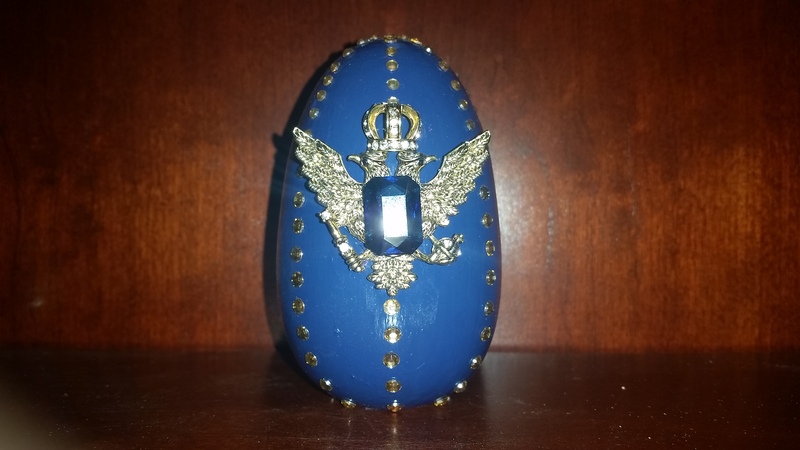 If interested in more information regarding other Romanov Jewels, please click on two posts about the House of Fabergé and Fabergé Eggs. 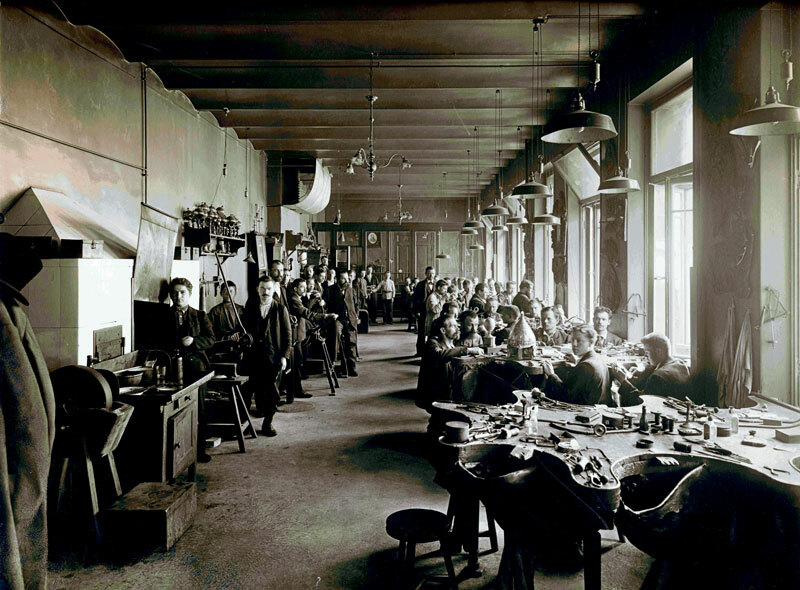 The first post gives a brief history of the Fabergé company started by Peter Carl Fabergé. 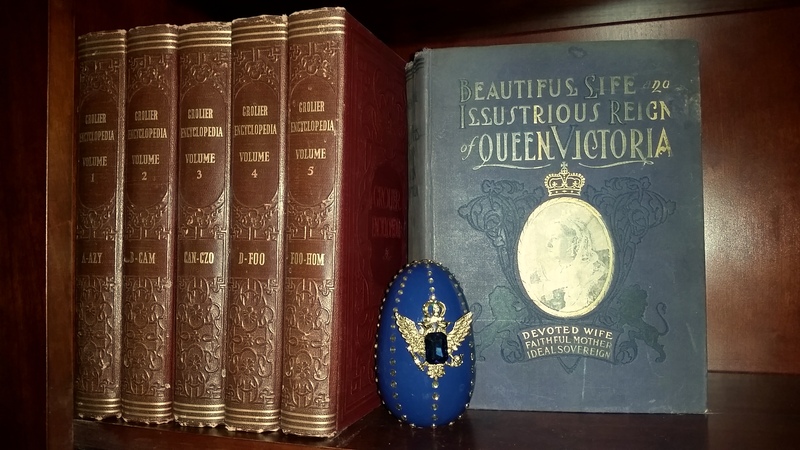 The second post gives information about the beautiful jeweled 54 Imperial Eggs that Fabergé created for the Russian Tsar Alexander III and later his son Tsar Nicholas II between 1885 and 1917.